First impressions are invaluable in any business. If your goal is to create a favorable image for everyone who visits or drives past, landscaping can be a key part of the equation. If you also want landscaping that looks great year-round, then GMS is your solution. We help businesses throughout Brookfield, New Berlin and Elm Grove maintain their outdoor appearances. We don’t work with cookie-cutter landscaping plans. Every landscape is tailored to the specific layout, geography and needs of individual business property owners. We listen to your ideas, then design landscaping that is both low-maintenance and planned around future growth and maturity of its plantings. Our landscaping designs are made to complement your building or other facilities. We use a wide variety of trees, bushes, shrubs, flowers, perennials, stone and decorative rock to create just the right look for your property. Our offerings include specialized landscapes such as native plantings, rain gardens, privacy screens and shade plantings. We’ll keep your landscaping looking its best with regular weeding, pruning and trimming. We can add or refresh mulch at any time – you choose from hardwood, Enviro Mulch, hemlock or tree service chips. We always pull weeds and spray for weed control prior to mulch installation. We want landscaping that fits in with your property, but also stands out. You work hard at your business, and have good reason to be proud of it. 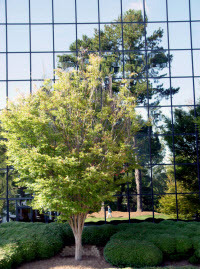 We’ll design and maintain landscaping at your company that reflects that pride, and always leaves a good impression. Call or click to receive a quote for the design, installation and maintenance of your commercial property or business grounds.